in Mexico City. April, 4 2010. New York - The monks of Holy Trinity Skete in Mexico City thought the worst was behind them when the swine-flu epidemic of 2009 subsided in Mexico. The worst was yet to come. Last year’s swine-flu epidemic signaled the start of a most difficult year for Holy Trinity Skete in Mexico City. The flu-quarantine ruined the monastery’s finances, while the abbot’s health took a turn for the worse. A year later, the monastery is struggling to make ends meet. Since its foundation three years ago, the Holy Trinity Skete has become, according to abbot Fr. Nektariy Haji-Petropoulos, “the heartbeat of the Russian diaspora”. The services are conducted in Slavonic; Russian diplomats and ambassadors bring their families on weekends. 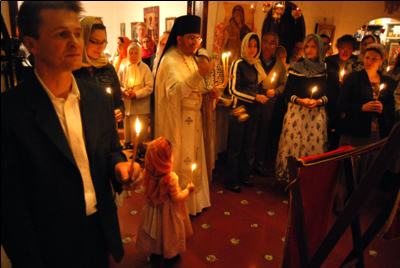 Russians, Serbs and Bulgarians come from all over the country for church services, celebrations, as well as spiritual and moral support and financial assistance. The monastery is very active in the local community: it provides medical and psychological aid in Russian to alcoholics and drug addicts, domestic violence victims; provides legal assistance to Russian women in case of a divorce from their Mexican husbands and questions of child custody; assists the needy and the unemployed. They teach the fundamentals of the Orthodox faith to their parishioners; accept pilgrims from all over the country and overseas. Until the swine-flu epidemic, the monastery was surviving on the proceeds from the skete’s bakery and the abbot’s salary as a university professor. But the five-week quarantine decreased sales by 40%, and the subsequent increase in rent forced the monks to abandon the bakery and lose their main source of income. Five months later they are still searching for a cheaper place. While the monastery holds an important place in the local community, most parishioners are Russian expats struggling to make a living as artists and musicians, and are in no condition to assist the brethren. The skete makes a very small amount of money from special commemorative services and candle sales. Considering his parishioners’ financial situation, Fr. Nektariy doesn’t even put out a traditional Sunday collection plate. He says the people have enough trouble keeping afloat to worry about the monastery as well as their families. Along with the whole of Mexico City, the skete is struggling with severe water shortage. Until they have enough money to install a bigger water tank and pump, the three brethren will have to continue to manually carry tens of thousands of gallons of water weekly to fill up the toilets and sinks. The brethren have been unable to pay their bills in the past five months, the rent on the monastery building increased in June, and more and more necessary expenses crop up. For more than a year now, Fr. Nektariy has been very sick, and almost died in October. He still needs regular medical treatment, and his medical bills take a toll on the skete’s finances. A few months ago the monks got a second car for the monastery in order to help Fr. Nektariy get to work. “I cannot climb up on the bus due to [the pain in] my knees,” wrote Fr. Nektariy in an email. “Even the subway could be dangerous in my weakness”. As much as they need the car, they have no money to pay for it and may have to return it to the owner. Despite enduring several operations in the last year and being in constant pain Fr. Nektariy fulfills his pastoral duties, and continues to teach Linguistics, World, Church and Art History at one of the Iberoamericana University in Mexico City. He also visits the sick daily. There are at least 500 families registered in the parish who very often request some type of attention from the monastery, he says. “We work very hard to sustain our monastery and the parish mission. We try not to become a burden to anybody but to be a helpful instrument to the Russian Community of Mexico. However things have become more difficult for us with [the closing of] our bakery and my health condition. Believe me, to be alive and to keep the mission open, are already big miracles!” wrote Fr. Nektariy in an email. Third earthquake in Mexico: "Now we are even more fearful..."
Mexico monastery: "So much pain and death around us..."